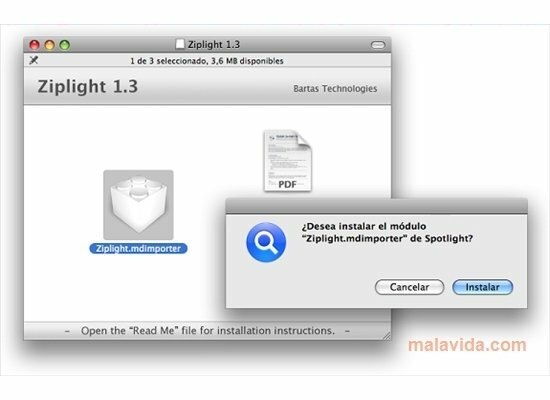 Ziplight is a free plug-in for Spotlight, the default integrated search engine in MAC OS X thanks to which you can locate files, mails, images, utilities,... on your computer by simply writing in the search box that it provides. It even allows you to search within documents and PDF files. To expand the possibilities offered by Spotlight you have a plug-in known as Ziplight that, once installed on the system, will allow you to search within the contents of any ZIP file, which is the compression format that is used natively by Mac. The installation is very simple: if you have Leopard double click on the plug-in icon, while if you have Tiger you have to copy it directly to the /Library/Spotlight folder. 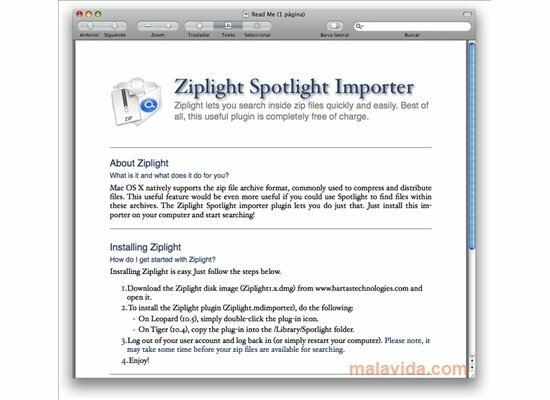 Even though the users of Snow Leopard (OS X 10.6) no longer need to download Ziplight due to the fact that the main function of this application is integrated in the system, it is still a very useful tool for the rest of Mac users that will be able to enjoy a file search engine that decrypts the contents of any ZIP file, with precision and as fast possible.